Jian Neo Chen is Assistant Professor of English and affiliate faculty of Sexuality Studies, Asian American Studies, Women’s, Gender, and Sexuality Studies, and Film Studies at The Ohio State University (0SU). His research explores trans and queer cultural practices in literature, film, performance, digital media, and theory and their re-imagining of social relationships and political movements within the contexts of late twentieth century and twenty-first century U.S. technologies of gender, sexuality, race, and empire. Chen's first monograph focuses on trans Asian American and trans of color cultures and movements as they emerge in the twenty-first century, having survived transnational U.S. state neoracism and capitalism and expulsion within multiple communities. 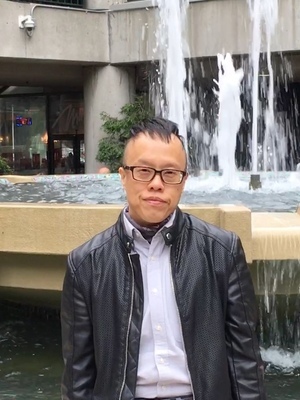 His work engages transgender and queer studies; cultural and social theories; film, performance, and digital media; mimetic literary and visual forms; post-semiotics; transnational approaches; Asian Pacific American Studies; and comparative racial analysis. Chen's scholarship, writing, and teaching seek to amplify trans and queer of color movements for liberation across different sectors in the transnational US political economy. Chen serves on the editorial board of the Transgender Studies Quarterly and the advisory board of the Museum and Curatorial Studies Review. He was an invited Visiting Scholar at the Asian/Pacific/American Institute at New York University (NYU) in Spring 2012. Before joining OSU, he was Assistant Professor & Postdoctoral Fellow at NYU’s Gallatin School of Individualized Study from 2009 to 2011. Chen’s publications appear in Trans Studies: Beyond Hetero/Homo Normativities (Rutgers University Press, 2016), Transgender Studies Quarterly, e-misférica, and Postmodern Culture. His curated transmedia projects have screened with the 6-8 Months Project, hosted by Kara Walker Studies in New York City, the New York MIX 24 Queer Experimental Film Festival, the Wexner Center for the Arts in Columbus, and the NYU Asian/Pacific/ American Institute. Before graduate studies, Chen developed and organized a popular literacy, workplace rights program for Asian immigrant women working in informal garment, electronics, hotel, and restaurant economies in Oakland, CA. He also produced community events and raised funds to counter hate, intimate, and state violence impacting lesbian, gay, bisexual, transgender, queer, and questioning communities in the San Francisco Bay Area.